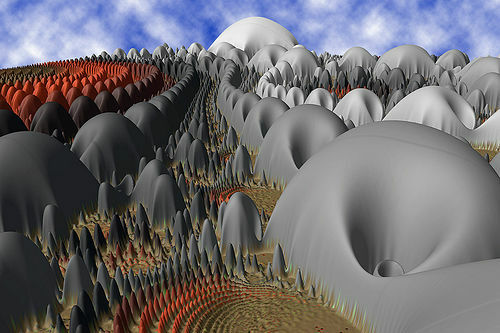 The first time I saw an image made in FractalWorks it was in the gallery section of Fractalforums.com. I was impressed and yet, I couldn’t quite figure out why I was so impressed. There wasn’t anything really special about it and yet there was something really special about it. 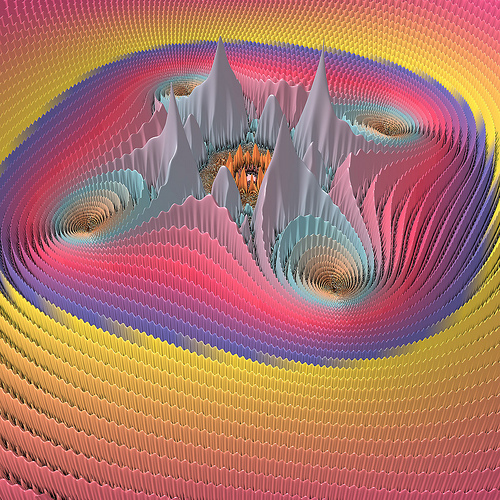 It was one of those “height field” fractals, a (somewhat old) trick to give flat fractals a 3D appearance. They’re all over the place and have been for years, but this FractalWorks one was different: more polished and more stylish than I’ve ever seen. It also seemed to have a slightly surreal and mysterious quality to it –a strange kind of silence. A comment by Paul N. Lee, the veteran fractal archivist, lead me to Duncan Champney’s website and to the incredible discovery that not only had Duncan made other images like the first one I’d found, he also made the program, FractalWorks, that they were created with. 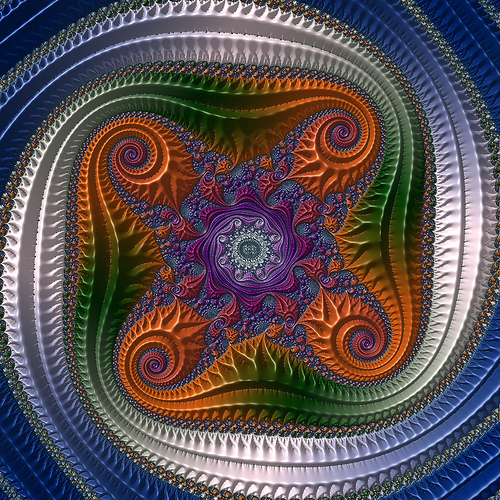 There’s a long tradition in fractal art of people performing the roles of both artist as well as programmer. Duncan Champney joins that royal list and furthermore offers his excellent program free to anyone who wants to share his passion for exploring what his super fractal machine can do. But before you head off to download it I should mention that it’s for Macs only. From what I’ve seen the program’s forte is 3D fractals of the height field, or geographical terrain, “relief” -variety. However, as simple and plain as that might sound in these modern days of Mandelbulbs and Mandelboxes, FractalWorks does this one thing very, very well. These sorts of old-style 3D fractals made in other programs can be rather kitschy to look at, but FractalWorks manages to achieve a quantum leap in rendering quality that gives this old technique a new and vibrant appeal. But of course as with almost any kind of fractal program, it still requires an artistic eye and the relentless persistence that only an enthusiastic explorer can possess to produce really good work with it. 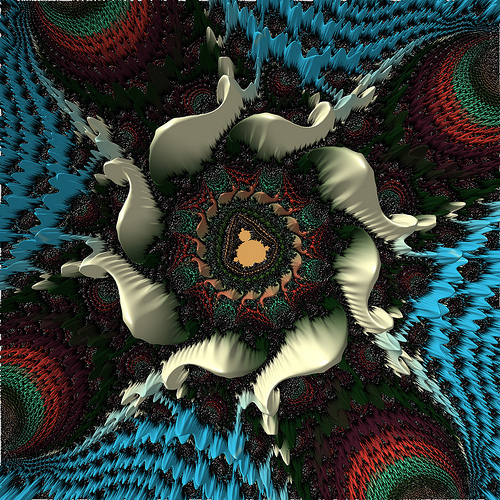 Ordinarily I’d just shrug off stuff like this as eye candy but FractalWorks has elevated this simple type of fractal to a new level of sophistication. There’s something fresh and different here. Like I said when describing my first encounter, there’s something special and captivating about these FractalWorks works. Some have a fairy tale look to them and others suggest a landscape that is much more surreal and haunted. 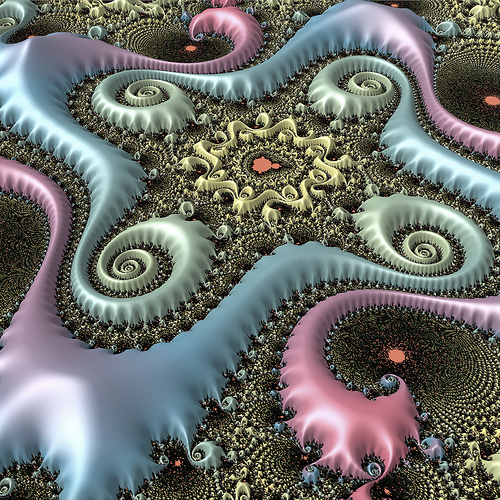 Don’t let the fruity, frosty renderings fool you; there’s more to some of these FractalWorks images than mere graphical sweetness. Duncan Champney wrote the program and started up a Flickr group to get people interested in it as well as to offer advice and encouragement (I’m just guessing). Although Duncan produces some of the best images made in FractalWorks, I discovered from the Flickr group someone who also makes work that is equally good: schimkent! I think the proof of a really great program is in what the users of it can do and not just the super results the author can get with it. 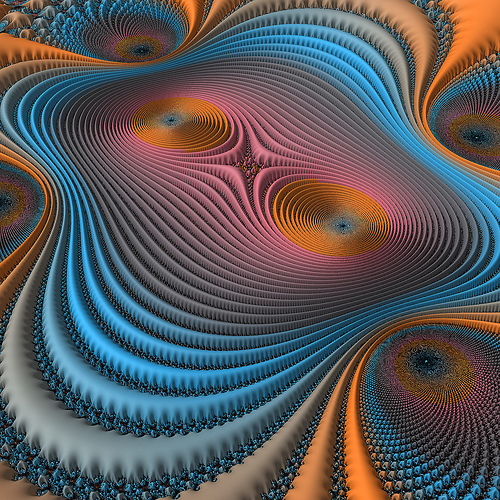 Shimkent (and others) have shown that Duncan has created a very capable and creative fractal art tool in FractalWorks. Even if it is only for those Starbuck sipping, sophisticated Apple computer users… They ought to have at least one good fractal program, shouldn’t they? Schimkent: I think his real name is Kent Schimke (hence, the clever screen name —schimke-nt). Kent’s LinkedIn profile says that he is “…helping a developer create a fractal generating program called FractalWorks for macintosh computers.” I think it’s pretty safe to say he’s the guy. Kent’s got a really good eye for color and also seems to have a good grasp of what makes for a good 3D FractalWorks scene. Both he and Duncan have made some very eye catching and interesting images. I would never have thought such a simple 3D height field program could produce such a wide range of creative works but I guess, as Kent says, “You just don’t know what you can’t do.” Well, Kent seems to have excelled in pushing FractalWorks’ envelope and taking us to new places. 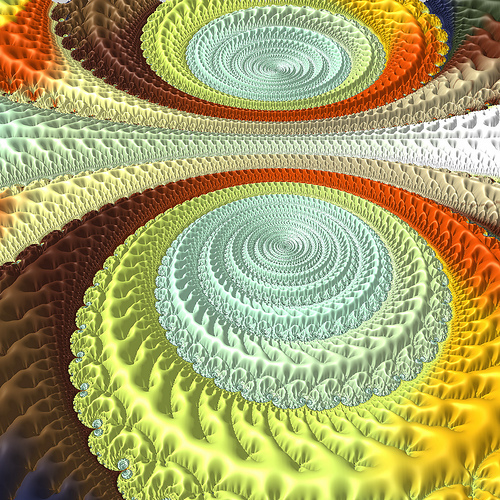 Touch of vertigo, by schimkent, made in FractalWorks --see what I mean by schimkent's great eye for color? In addition to his own Flickr gallery, Kent has also recently had a wall calendar featuring some of his FractalWorks images published by Browntrout entitled, Chaos Fabulous Fractals 2010. This is not the Cafepress, self-publishing, print on demand type of thing (the one at a time whenever someone buys one), but rather the traditional editor/publisher/press-run type of publishing. FractalWorks is a free, high performance fractal renderer for Macintosh computers. You can download fractalworks and try it yourself at the FractalWorks download site. 04 May 2010: Version 0.6.2 has expired. I just uploaded a new version, version 0.6.3 to the link above. Please upgrade to the new version. I majored in Geography back in my university days and I think one of the things that drew me to that subject was all the imagery that one ends up studying, particularly the Remote Sensing images. Perhaps part of the appeal that these FractalWorks images has for me is their similarity to maps and especially aerial photographs, something which the Wikipedia defines as “the taking of photographs of the ground from an elevated position“. Another legacy of my geography days was the slowly developed ability to view stereo pairs of aerial photographs without the special lenses that make it easier for your eyes to perceive the 3D effect. In digital art circles this special 3D imagery seems to be called “cross-eyed” stereogram. I take it from this stereogram set posted on Duncan’s site, that FractalWorks is able to produce the paired images that produce this three dimensional illusion. Here’s another also made in FractalWorks but slightly different in that you need red-cyan 3D glasses to view it (the old-style 3D movie glasses). And here’s an even better one. Wait! This one too! Go out right now and buy a pair of red-cyan 3D glasses so you can see this one!!!! (try the high res version on Flickr for an even biiiiiiger thrill). FractalWorks produces a kind of high-quality imaginary aerial landscape. 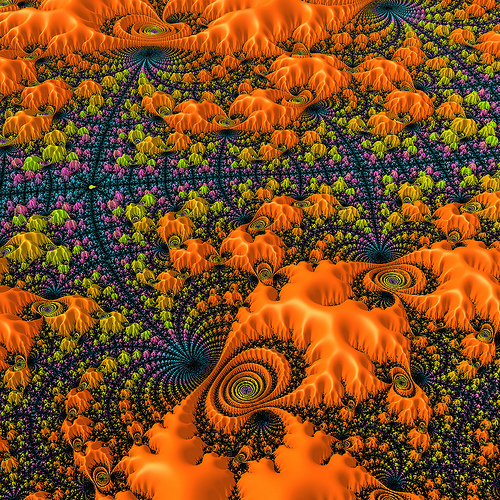 Of course, that was always the intent I believe of the height field effect in fractal programs. It’s just that FractalWorks has come along and achieved much better results than any other program that creates these kinds of fractal images, at least of all the ones that I’ve seen so far. 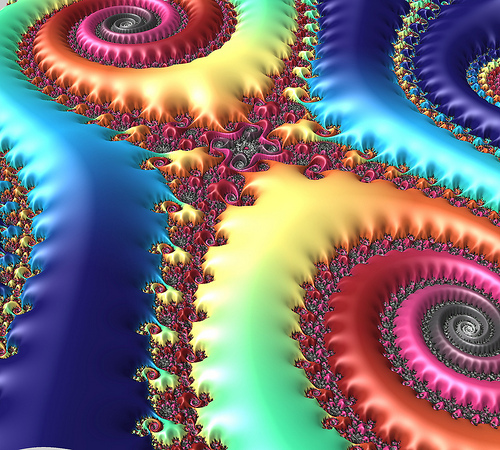 Although I’m sure Ultra Fractal or Chaos Pro could be programmed to produce similar smooth and richly colored images like this, no one seems to have attempted it yet (although there have been good examples of a mild form of 3D relief imagery created with them already). Well, three cheers for Duncan Champney for making this Mount Everest Machine of fractal programs and taking us right up to the top of it along with him. And to Kent Schimke, his agile sherpa for showing us how great the views can be. Well, I could go on and on doing this. 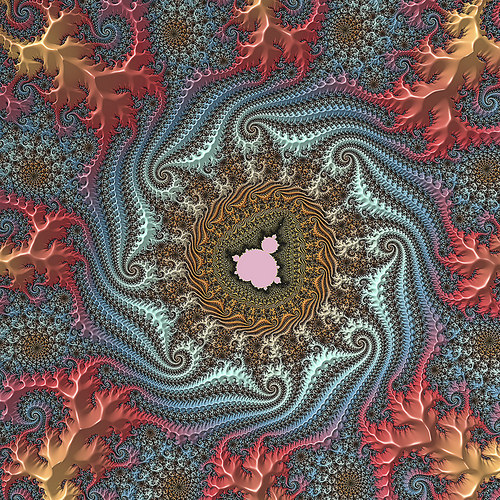 These FractalWorks images are really something. Too bad I don’t have a Mac. Oh well, we can still look at the results. You can browse the entire Flickr group at this link. And should you happen to own a Mac, why not download the free program and try it out while you’re sipping your Starbucks coffee and looking as stylish and hip as Mac folks always do? There are some really interesting images available as well for viewing. One of my favorites is “Elephant Julia Relief map #2”, which reminds me of a very ornate quilt made for royalty. 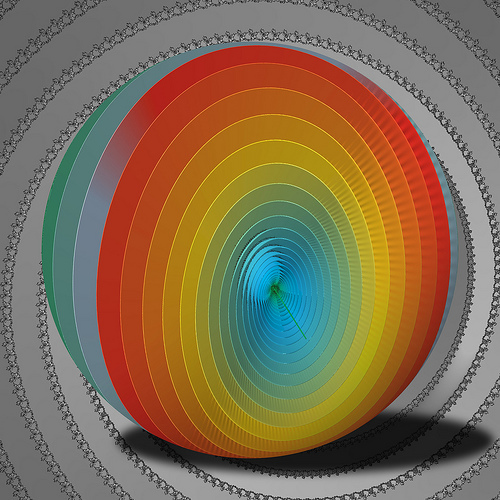 FractalWorks is definitely a must-have program for any digital artist running with a Mac OS. It was by chance that Duncan’s phase websight caught my eye while hunting down computer generated art. From that day fractals have become not only an obsession of mine but a very therapeutic way to calm the nerves after a bad commute. Thank you Tim for this complementary blurb. I have been trying to equal Duncan’s quality and admittedly what I know about fractals I got from FractalWorks and Duncan.